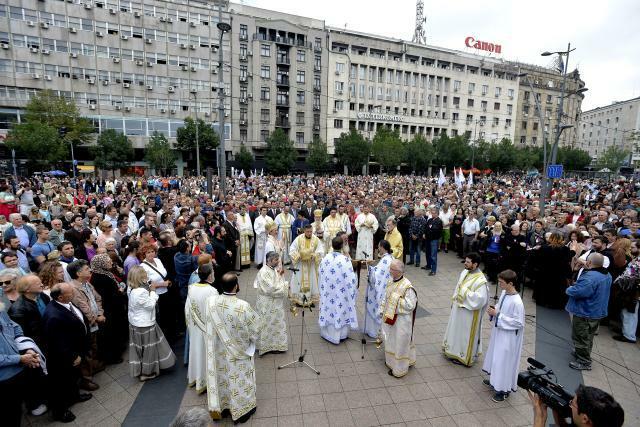 BELGRADE — The Serbian capital celebrated the Ascension of Jesus with a liturgy at the Church of the Ascension and a procession in the city streets on Thursday. Belgrade Mayor Dragan Đilas and City Assembly Speaker Aleksandar Antić attended the celebrations. The procession was led by Serbian Orthodox Church Patriarch Irinej. Belgrade marks the Ascension of Jesus every year in memory of 1403 when Despot Stefan Lazarević declared the city the Serbian capital. The Ascension of Jesus is also tied to another key event in Serbian history – the adoption of the most important legal document of the Serbian medieval empire, Dušan’s Code, in 1349. The current way of marking the day was first established in 1862, and brought back in 1993 after a long break following World War Two. The City Hall is hosting a reception on Thursday evening.